A nice change from the ordinary and nice surprise for your guests at a dinner party. Cold-cured with sugar, salt, and fresh dill, lox has a delicate flavor and is delicious served as an cold appetizer. When choosing your salmon, buy either with or without skin. It will not effect the out come. Use fillet cut not steak cut which is the fish portioned with cuts going through the backbone. (be generous with the dill, the more the better). Rinse fish with cold water and pat dry with paper towel. Check for any bones and remove using a tweezer or needle-nosed pliers. Cut the fillet into two equal halves. 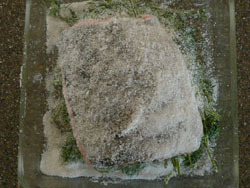 Combine the sugar and salt, then cover both sides of each fillet half with the mixture. Sprinkle with pepper. Wash the bunches of dill, stems and all. Grasp the bunch of dill and twist a couple times. Like wringing out a wet towel. It will be much easier to remove from the lox once the curing is done if you do not chop it up. 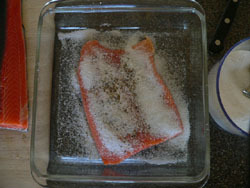 Next, place one fillet half in a dish and spoon more the sugar/salt mixture onto the salmon to cover the fish completely. Place the twisted dill on top of this fillet, then cover with the second half of salmon, putting flesh side down making a fish and dill sandwich. Spoon remaining sugar/salt mixture over the fish. Slide the salmon into a plastic bag, close the bag and let sit at room temperature about an hour until the sugar/salt mixture has melted into the fillet. If the weather is hot it may only take 30 minutes. 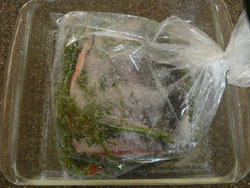 Place bag of fish back in clean dish and place another dish or plate on top of the plastic bagged fish. 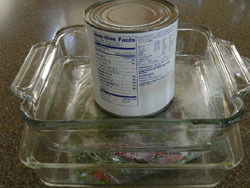 Weight the plate lightly using a canned food. Refrigerate the weighted fish for at least 2 days but not longer than 7 days. Every 12 hours, turn the fish over in the brine liquid that has accumulated in the bottom of the bag to ensure that all parts are evenly marinated. After Curing process is done, remove the lox from the refrigerator, pick off dill and lightly rinse off seasonings; pat dry with paper towels. 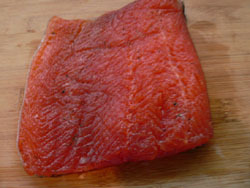 Place the salmon lox on a cutting board so you will be cutting away from yourself from the tail end first. Use a sharp knife such as a fillet knife. 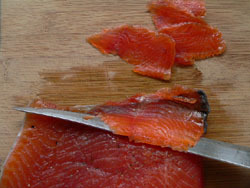 The lox should be sliced paper thin on an angle pulling the slice away from the skin. 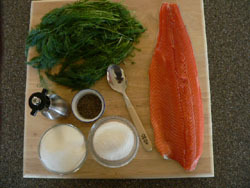 Serving suggestions: Layer the Salmon lox slices on crispy bread or rye bread and a sweet dill mustard sauce. 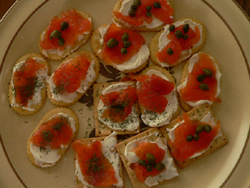 Lox also pairs well with capers and finely chopped onions. Lox will keep for up to a week if refrigerated properly and in the freezer for up to a month.